This photo is nostalgic in that it shows the International 14 at the end of my era; open layout, wood hulls, single trapeze, symmetric spinnaker. Within a year the class would adopt the double trapeze and shortly after that the assymmetric spinnaker. This photo is from Yachts and Yachting magazine and was the header photo for their Championship Roundup section which usually appeared in an October issue. The POW stands for the Prince of Wales Cup, a long distance race held on Thursday during the English Championships. In an odd but very sensible tradition, winning the one-shot POW was much more prestigious than winning the points championship for the week. As an aside, the International 14 Annapolis fleet held a reunion this past January. About twenty of us showed up but I'll spare the reader of any photos of old, bald-headed, slightly paunchy dinghy sailors whose prime was forty years ago. "I have a fuzzy but still vivid memory of sailing a sit-on-top American Sailfish one afternoon as a teenager. Pure unadulterated fun blasting back and forth. No other craft gives you the feeling that you are part of that bow wave, curling and then flattening as it reaches you, bouncing and bashing, spray enveloping you, as you careen back and forth. The precariousness of fighting to stay on the slippery deck just adds to the adventure. Two Alcort Sailfish photos culled from the Internet. 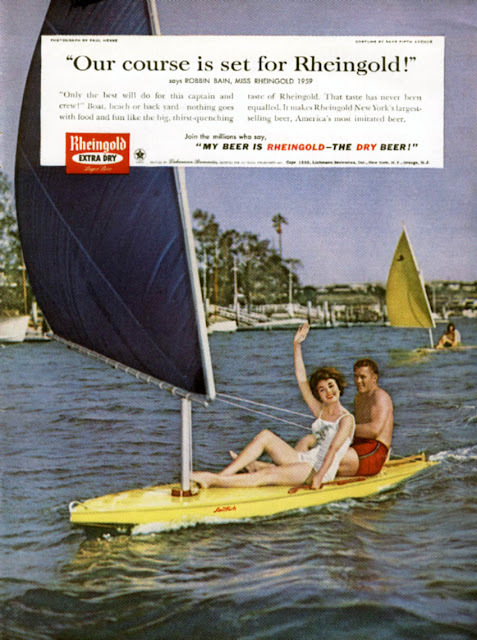 The first is an ad for Rheingold beer featuring the Sailfish. "The Alcort Sailfish deserves the love. That unsophisticated little boat, with its philosophy of simplicity and low cost, coupled with the practical features of ease of transport and ease of storage, would have given access to sailing to many, many people who otherwise would never have had an experience of the sport. "The designers of the Australian Sailfish never made any secret of the fact that their boat was inspired by the original Alcort Sailfish and its underpinning philosophy. This is made clear on the Australian Sailfish website. 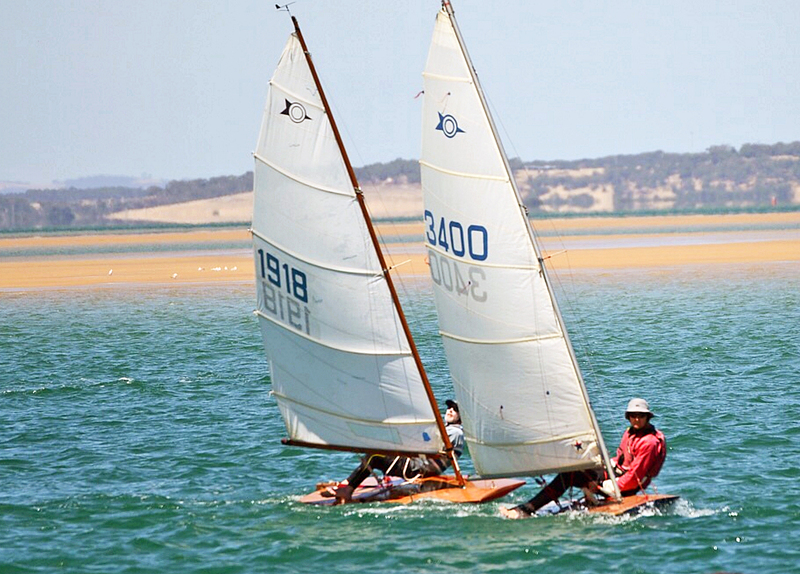 The Australian boat is of similar overall dimensions and has the same sail area. 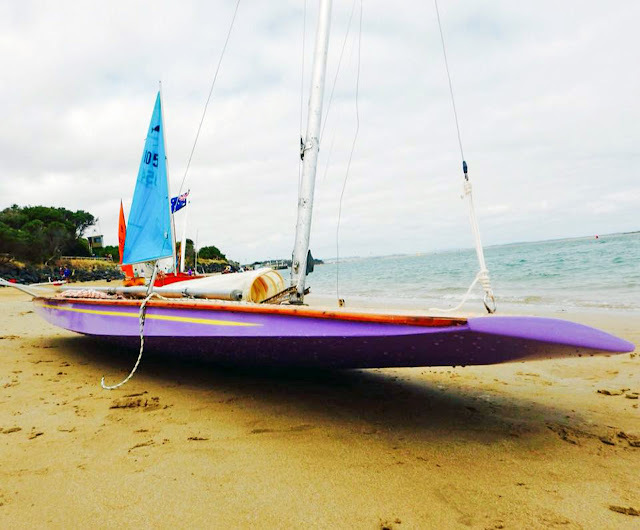 It differs in that it is a scow, it's lighter and has a stayed Bermudan rig. These differences may allow it to point higher and plane earlier and faster, but they come at the cost of some of the simplicity of the original. "As I have noted ... 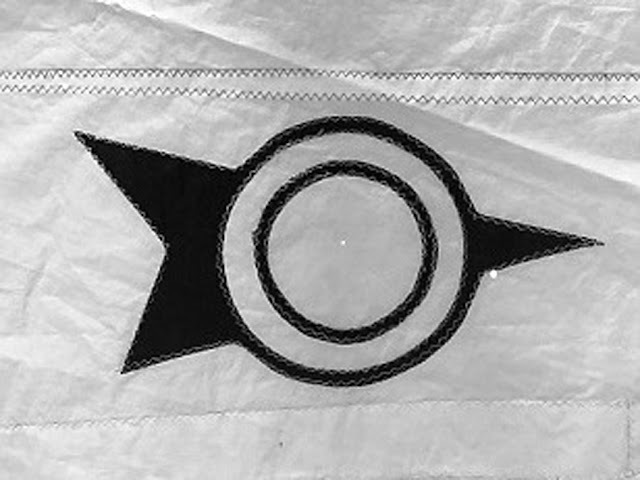 I believe the Australian Sailfish insignia is, in part, an abstraction of the Alcort Sailfish logo. If it is, and it's a view not necessarily shared by my sailing mates, I reckon it is an appropriate and appreciative acknowledgement of the inspiration for our Aussie boat. 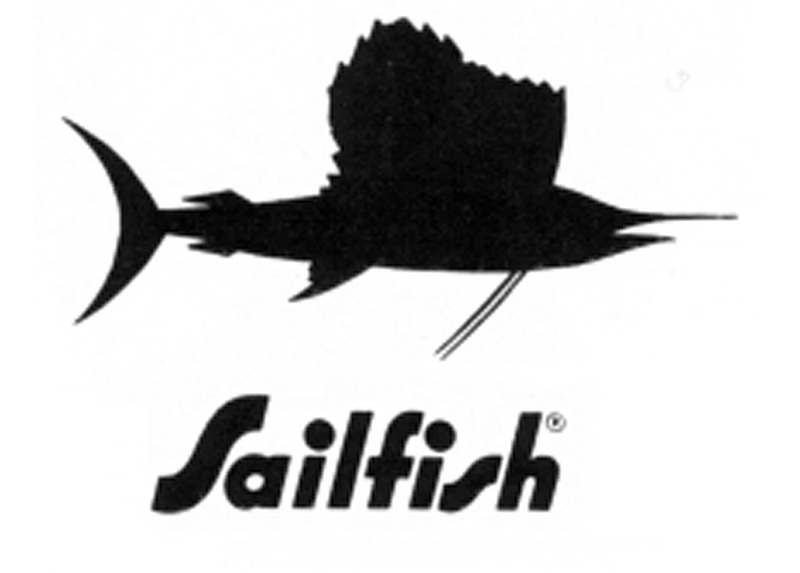 The American Sailfish logo and, below that, the Australian Sailfish logo. I can see the abstraction but I'll let the reader judge for themselves. The previous header photo was a start for the World's most popular Classic Moth, the one-design and ex-Olympic class, the Europe Dinghy. 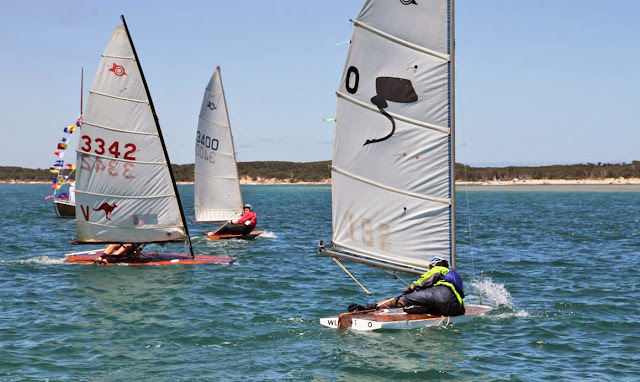 The Europe Dinghy remains a very popular singlehander in Europe, attracting the lightweight skippers that normally would fit into the Laser Radial class in North America. 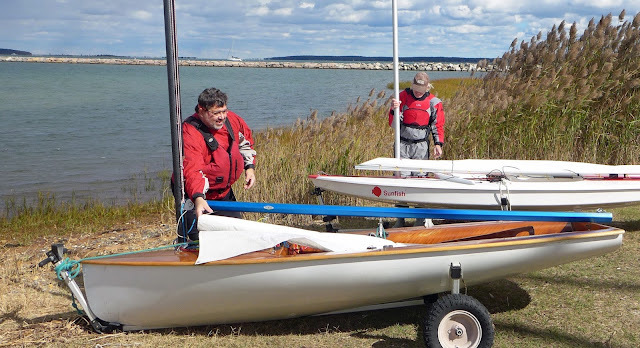 Here in the U.S. many of the Europe Dinghy's have been snapped up by our Classic Moth crowd where they are a potent competitor at the Gen I level. (even though several of our older Mothists are sailing their Europes above "racing weight"). 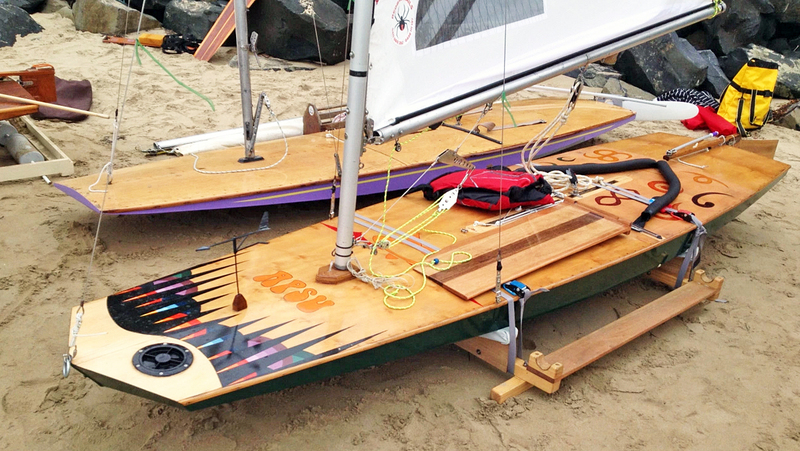 The Charleston, South Carolina Classic Moth fleet made a push last year and restocked their fleet almost exclusively with Europe Dinghy's. 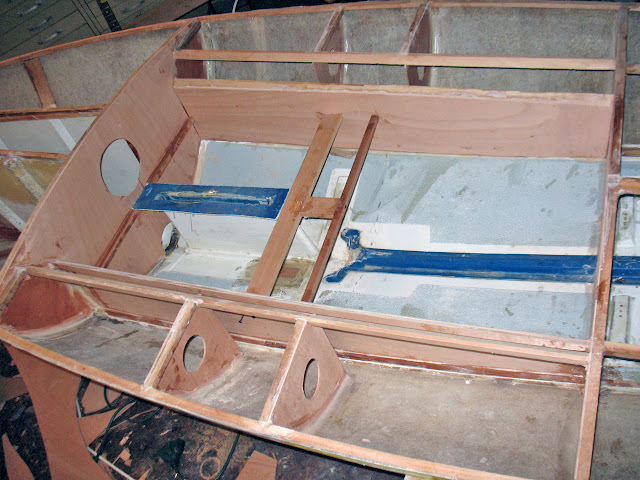 As to be expected, the boat building contingent in the Classic Moth class can't leave the standard Europe Dinghy alone. (Part of the incentive to change things up is to lighten the package, as the Europe Dinghy class weight, 45 kg, is about 8 kg heavy within the Classic Moth class rules.) Last year Bill Boyle launched his stripper Europe he built from scratch. Two builders have gone the easier route and redecked older glass Europe's in wood. 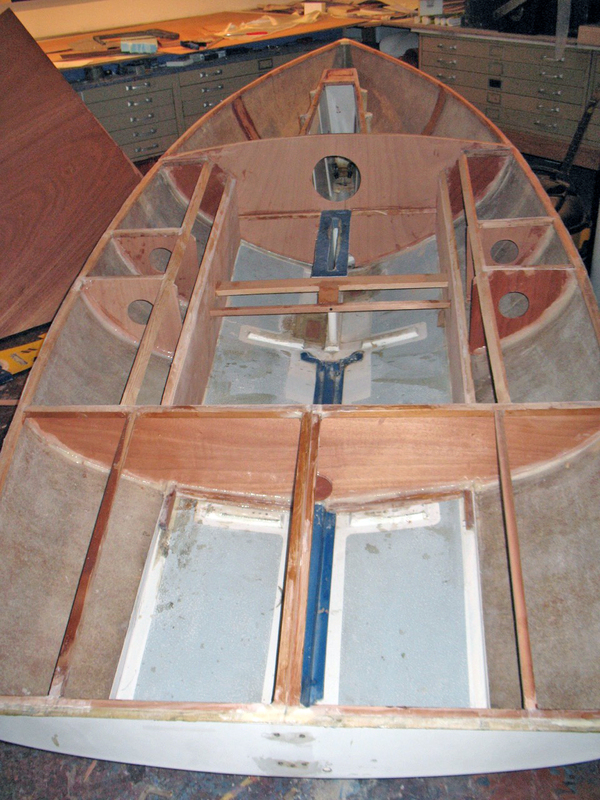 Mark Saunders redecked a Europe Dinghy three years ago which was written up by George A. in his blog. 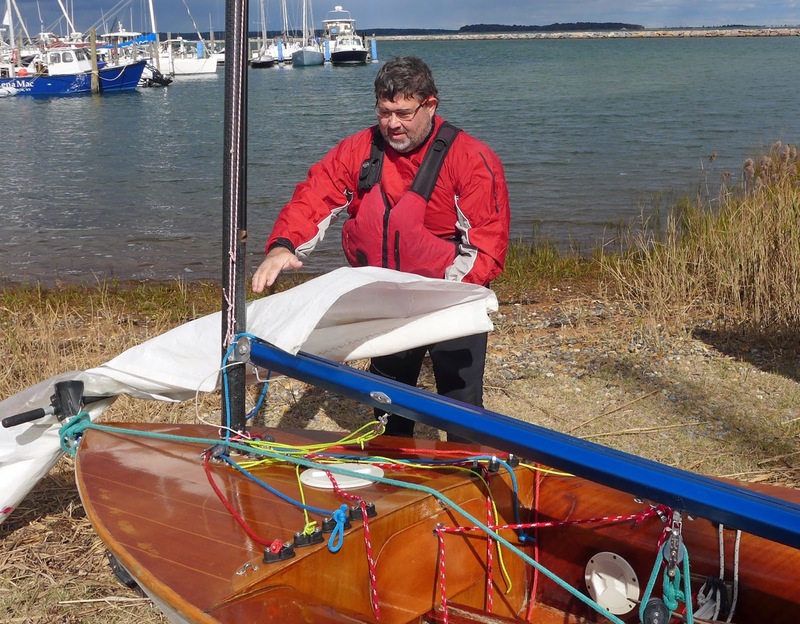 Scott Sandell from the Sag Harbor fleet, redecked a Europe Dinghy a couple of years ago and sends along this report and some photos. "My boat [Europe] is a Winner from 1989 or so, and had a soft deck (the tanks on these boats get soft over time). One of our guys tried to repair it by slapping on layers of glass, but it just made it worse (and heavy), so on a whim, and outside in a snow storm I hit it with a saber saw. Remarkably satisfying and almost cathartic! I cleaned the whole thing out while I waited for the ply to arrive. However, there wasn’t much time before the season was supposed to start and although I wanted to order ply from Boulter in Boston, Noah’s, or CLC, I went with a local company who delivered (at twice the price. . . dumb). When the truck came I realized they’d brought 4 mm instead of 3 mm, and I almost sent it back but I didn’t have much time and figured “how much heavier can it be?” The downside was that while I’ve always been able to cut the 3 mil with an x-acto knife, I needed a power saw to cut the 4 mil. "And, of course, the boat was heavier than I wanted. "Once I realized how far off my game plan I was I decided to make light of it and created “the gentleman’s Europe” complete with floor boards. I even designed a cupholder that accommodates a Reidel Bordeaux glass, and I painted the hull pink and made a red sail. Just for fun. The interior bits glued together before the deck goes on. I didn't realize the fore and aft length of the original mast box (at least in the production Winner's from this era). 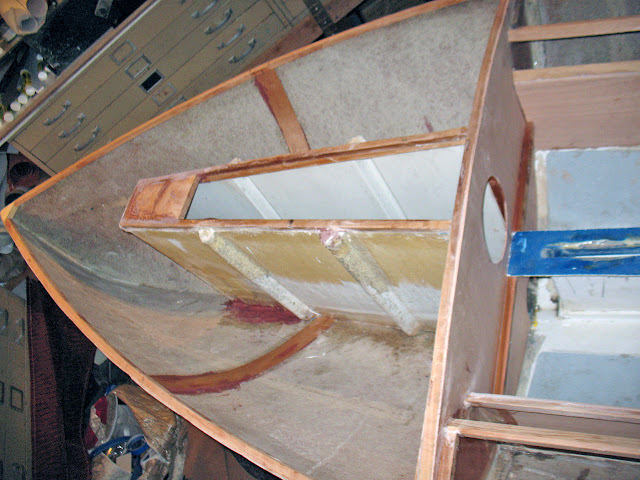 U.S Classic Mothists like to use the tub cockpit configuration. Scott Sandell follows the trend here. With a tub cockpit there is less water sloshing around. Finished deck. A wood deck certainly adds some class to a stock Europe. 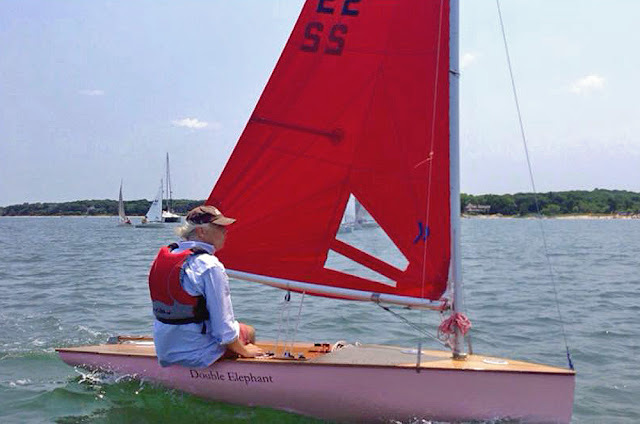 Double Elephant, with her pink hull and red sail, can't be missed on the water! Scott went with the simpler aluminum stayed rig instead of the normal unstayed carbon rig. 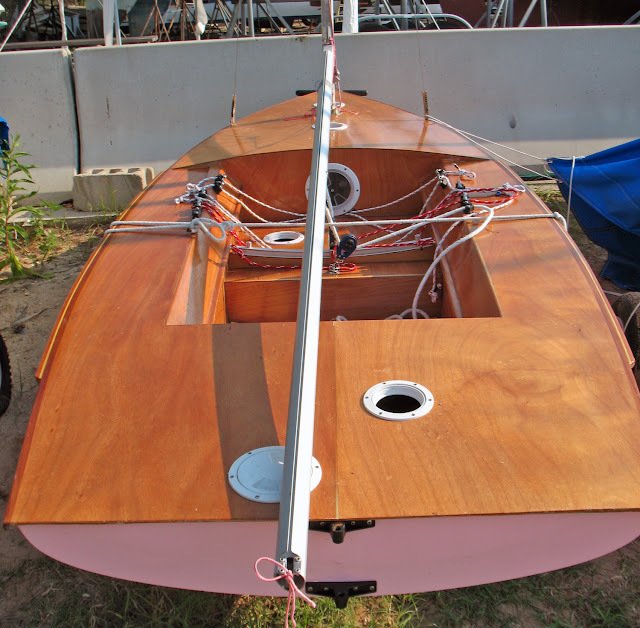 Don't forget the beautiful cold-molded 1970's Europe Dinghy's from European builders like Roland, Cristalli, and Galetti. Ed Salva owns this Roland which is a glass shell with a Christalli wood deck. And more woodie Europe Dinghy's. Valentines Day 2017: SIYYU "Stop Us"
SIYYU 'Stop Us' from Lorena Medina on Vimeo. Eleven Australian Sailfish made the trip to South Gippsland Y.C. 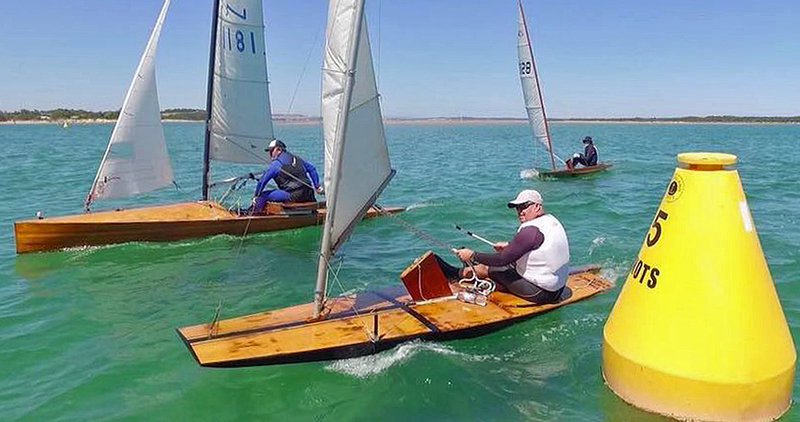 's 2017 Classic Wooden Dinghy Regatta (Australia Day weekend, January 25-28). 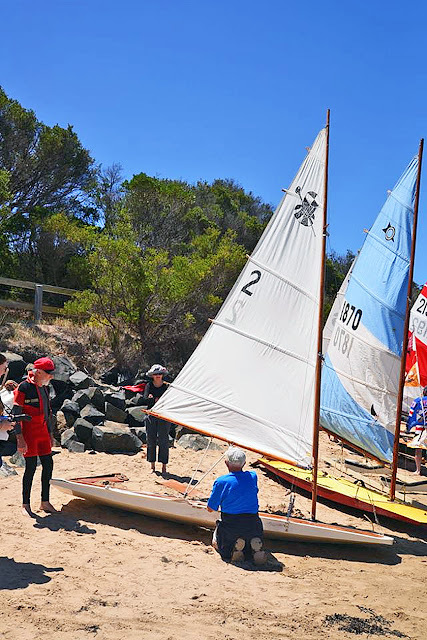 This was an astounding number given that class stalwarts from the 1960's, 1970's and 1980's didn't start organizing until six months before the Inverloch regatta. As to be expected, this gathering of Australian Sailfish skippers was a reunion of primarily grey-beards. It will be interesting to see if the class can harness this new-found energy into some new builds and some younger skippers. It would be great to see the class translate a reunion into a renaissance of the Australian Sailfish. Greg Barwick's more detailed report on the weekend from the Australian Sailfish website. A Sailfish rounding a mark with the wooden International Canoe on the outside. Chris Cleary (no. 1918), who contributed two Sailfish articles to Earwigoagin, chasing the eventual winner, Steven Floyd (no. 3400) who was the last national champion in 1987. 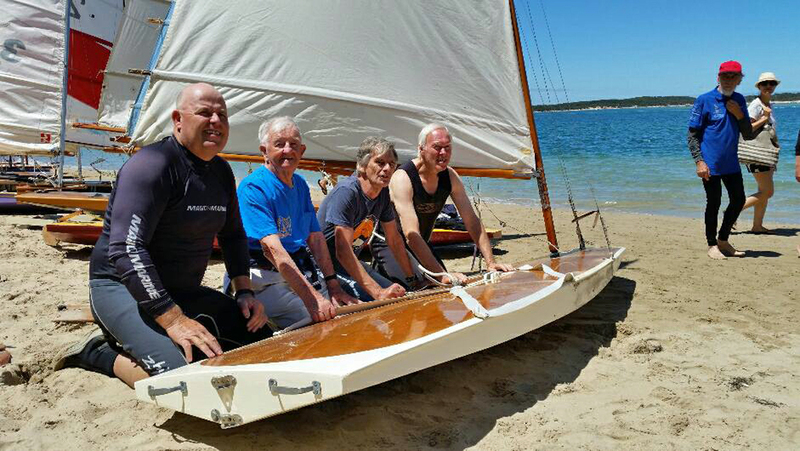 Chris Drury had the newest Sailfish at Inverloch. A beautiful graphic design on the deck of a restored Sailfish. Ian Milton's Apsu. Ian Milton on Apsu focused on punching through a wave. The bow snout of the Australian Sailfish. Chris Drury's Blowed if I Know. A race start. I've seen several sheepish comments from the skippers that starting skills were very, very rusty, hence only three Sailfish in this photo. Four Sailfish skippers were able to reprise a photo-op from the 1970's. 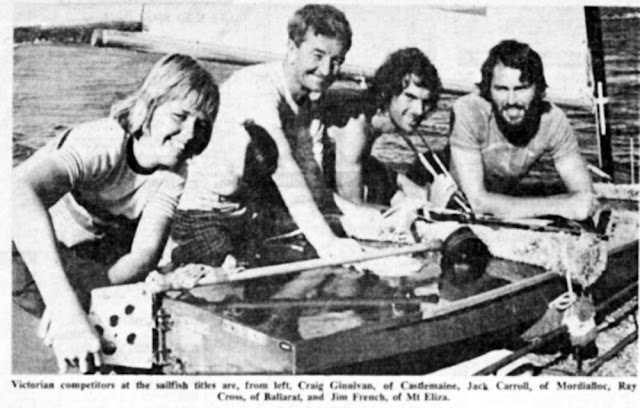 Jack Carroll, the Sailfish designer and class founder is second from the left. The Sailfish is Jack Carroll's original, no. 2, Debonair. The original photo of the foursome from the 1970's. 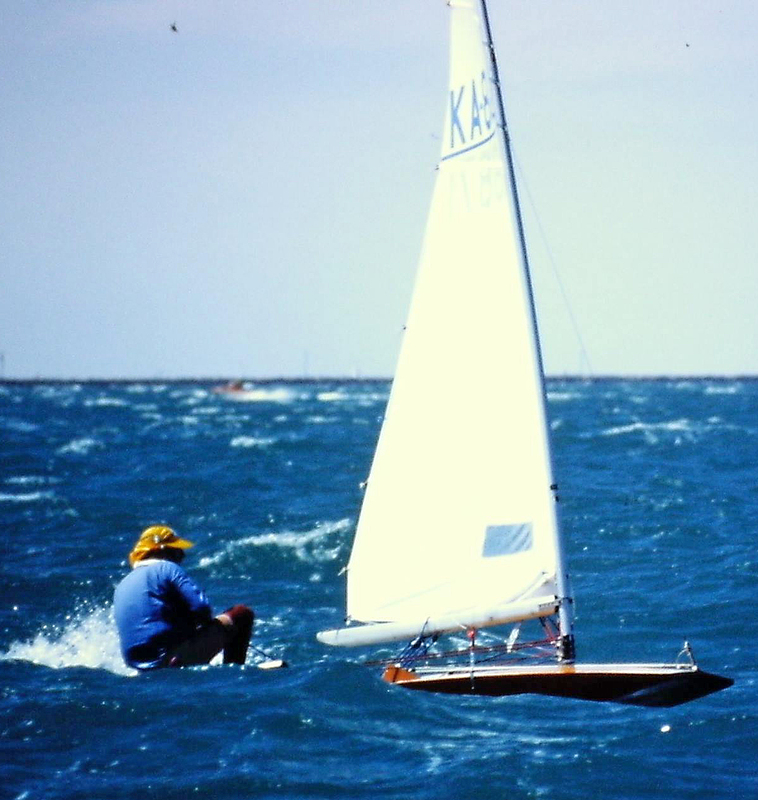 Jack Carroll tweaking on his original Sailfish. Tony Hastings made this video of his race at the Classic Dinghy Regatta on Flotsam, his restored Sailfish. 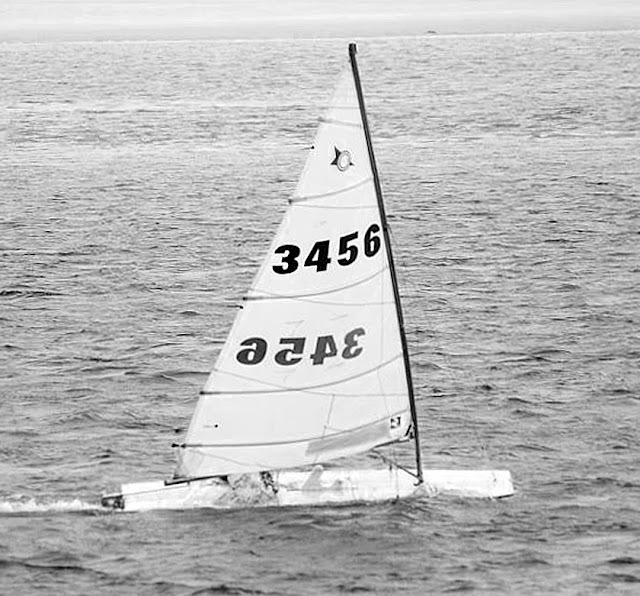 Some rot in the transom allowed the gudgeons to pull away and the rudder to float up, ending his race (starting at 8:44). For those who wonder how you tack these narrow. low boom craft; the tacking sequences are at 1:41, 2:12, 7:00, and 7:41 in this video. Chris Cleary left a comment about Tony's unorthodox tacking technique which I've tacked onto the main post. "Tony's tacking and gybing technique is very idiosyncratic. He has end-boom sheeting on his boat, which I hadn't seen previously on a Sailfish. That gave him space for his mid-boom belly flop. Effective though - he had his appropriately named relic going like a rocket. We were sailing side-by-side on very thin water in an attempt to avoid the worst of a strong ebb tide when disaster struck for Tony. He's an excellent sailor - a current top 10 Australian Paper Tiger catamaran skipper. Abbreviated plans for the Australian Sailfish. 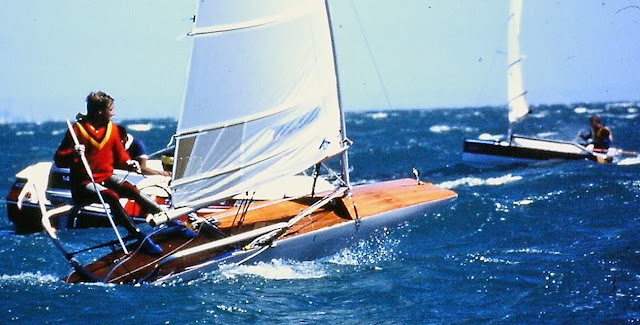 In response to my post about the 505's and their array of strings, Kiwi Neil Kennedy (who seems to have a vast archive of vintage magazine material about dinghy sailing) sent along a Yachting World article from May of 1972. 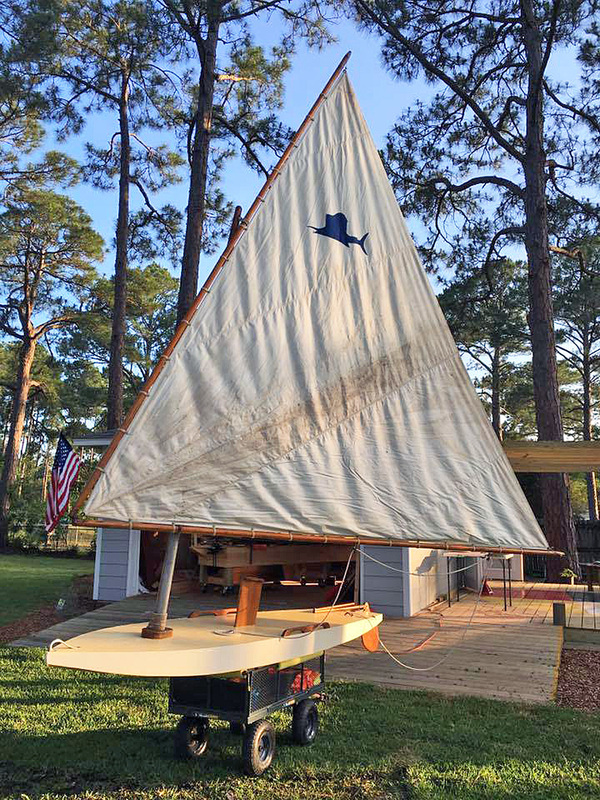 It featured a recently launched Flying Dutchman, Hucklebuckfive, a craft that was billed as the "Worlds most complicated dinghy." Attached is a PDF of that article. Of note is the "blobcatcher" (pg. 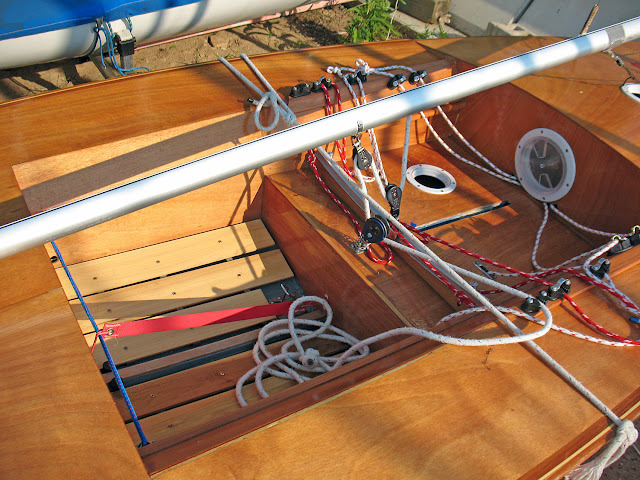 2), which used a clock mechanism to adjust the jib halyard "one click at a time." 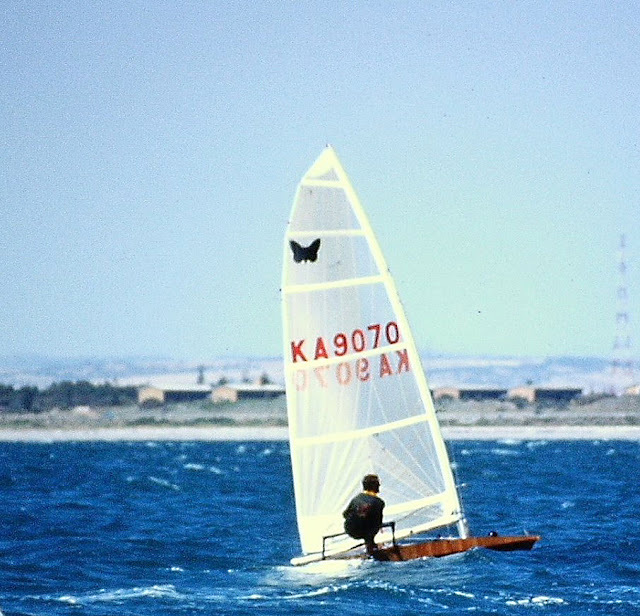 The second photo is a scow Moth rounding a mark in a cloud of spray at the 1986 World Championship, Largs Bay, Adelaide Australia. This was the Worlds that would mark the end of the scow Moth as a competitive design type in the Moth class. 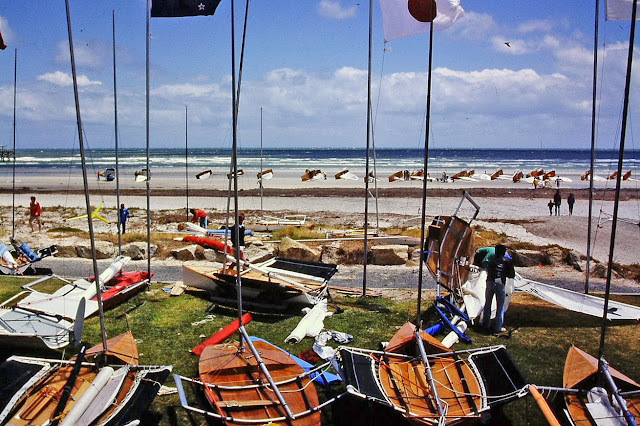 At the Largs Bay Worlds the Southerly Buster blew hard, blew the "tails off the horses" every day. This was survival racing, ideal scow weather but this time the contemporary wisdom was reversed, a narrow skiff won; Australian Steve Shimeld in his Gladiator design. Thus the shades were drawn on the scow. I've collected some other photos from the 1986 Largs Bay regatta. A start. This looks relatively moderate for the beginning. Some of the scow Moths had become thinner in an attempt to match the skiffs. This is one of them, with the wings right at the back end, launching off a wave.